Hi, my name is Keyi Qin. I am very excited to be a new instructor and curriculum developer at Chinese with Meggie. I am originally from Shanghai, China, and I graduated from New York University’s graduate program in Foreign Language Education (Chinese). After graduation, I have taught in a high school and some private institutions in NYC. I recently came on board to Chinese with Meggie to start training. Here is what I want to share with you the main difference between Chinese with Meggie and the schools I have seen in New York. First, Chinese with Meggie skips Pinyin instruction in teaching students in both immersion and elementary programs. Like many Chinese teachers, I was trained to believe that Chinese teaching “should” follow the pattern of teaching pinyin first and then Characters. Before, some teachers even told me that kids of or less than six years old have no aptitude to recognize Chinese characters. But for younger students, Pinyin instruction is not absolutely necessary because they have sharp ears that allow them to catch the characteristics of the pronunciation just as we pick up our mother tongue. In addition, young children have stronger visual learning capabilities than older students. They memorize characters as images. As the young students at Chinese with Meggie show, they are also quite able to recognize Chinese characters and to build up a visual vocabulary without ever encountering Pinyin. Pinyin is not an indispensable element in the class here. In this way, it gives children more room to learn Chinese characters and help them to build up a more well-round and authentic system of Chinese language. 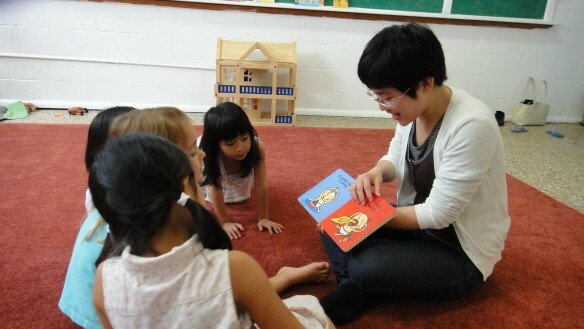 Secondly, compared with traditional language instruction, Chinese with Meggie emphasizes a play-based method to immerse children in the target language. I have observed several kindergartens’ Chinese classes in some private elementary schools in New York where they taught vocabulary to the kids using Powerpoint. All the while, kids are fidgeting, talking and asking when the class will be finished. The teachers had to stop teaching and retain their attention regularly. The class usually lasted only for 30 min. If they had been one hour, it’s unimaginable how the teacher could last. Here at Chinese with Meggie, students learn Chinese in a comfortable and warm environment. Students, both young kids and elementary students, sit on carpet to learn. Teachers would also take kids outside to the beautiful garden in a sunny weather. This reminds me of Suggestopedia, a foreign language teaching method developed by Georgi Lozanov. One of its main beliefs is that letting students to feel comfortable and confident in the physical environment is very important to their learning. And the teacher should love her students and teach them with personal participation through games, songs, arts and pleasure. Any specific school system carries with it the city’s impact. Chinese with Meggie’s approach reflects the spirit of innovation of Austin. Its focus on small class size and quality makes a real difference, and I’m excited to be here. This entry was posted in Chinese Language Classes, Elementary Chinese, Immersion Chinese and tagged Austin, Chinese class, Immersion class, TX by cwmmeggie. Bookmark the permalink.